After the train ride to Lopburi in which we came close to melting into the seats, we decided that air-conditioned bus travel sounded pretty nice after all. 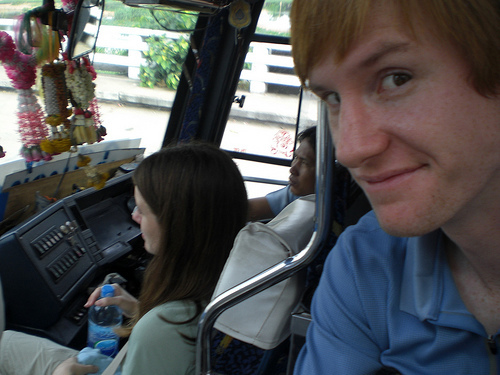 So we go to the bus station and purchase two tickets for a 4.5 hour bus ride to the city of Phitsanoluk, where we will change buses and continue to Sukhothai. We confirmed with the ticket agent about eight times that we were buying a ticket for an A/C bus and she assured us that it was an air bus. Well, too bad we didn’t confirm that we would actually be able to sit. Once we got onto the bus it became quickly apparent that all of the seats were taken and that those people who were standing were going to remain standing for the rest of the trip. Gage jumped off the bus and politely pointed out to the ticket agent that we paid to sit on a bus, not stand and that we would like at least a partial refund. She assured him that she would find us a seat and after some brief words with the driver, we were offered accommodation on the driver’s bed, located behind the driver’s seat. That wasn’t going to fly either, so I was given the navigator’s seat and Gage was seated on the stairs. As bad as that may be, the fact that the bus continually broke down and our 4.5 hour bus ride turned into a 6.5 hour bus ride only made it comical. Welcome to Asia. We paid extra for front row.